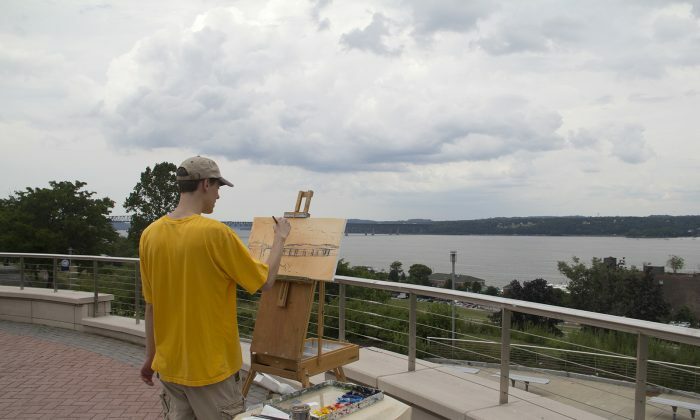 NEWBURGH—Artists from around the area gathered on July 30 at SUNY Orange-Newburgh’s Kaplan Hall for a Paint-Out Overlooking the Hudson. The skies threatened as Linda Barboni, Janet Howard-Fatta, Dennis Fanton, Anne Kelly, Mary Mugele Sealfon, and Mitchell Saler depicted the Hudson River from the campus plaza green in various media. Soon a heavy thunderstorm engulfed the scene and the artists continued to work inside, taking advantage of floor-to-ceiling vistas. Kelly worked in pastels. Her multicolored landscape turned the treeline above the river into a colorful forest. The trees were no longer just green but lit up with the colors of the artistic imagination. Saler, the youngest artist in the group, studied the river with a focus on a bridge in the distance. His oil painting reflected the Hudson River School style. He said he does landscapes en plein air, painting a landscape scene directly outside, and also using photographs. He studied the Hudson landscape as the sky darkened. “I pay attention to the atmosphere, the soft clouds, and thicker trees,” Saler said. Fanton does oil and pastel landscapes in the summer and fall but does still lifes in the winter. He likes to use pastel because “you can do layers and layers, especially with this sanded board,” alluding to the surface he was painting on. She works hard to keep compositions simple and tries to instill that in her students as well. “For myself just to put in the essentials and keep the composition and design basic,” she said. She also likes to experiment with different textures of paper. She did one study that day on a smooth surface and another one on a visibly rough surface. SUNY Orange Cultural Affairs supported the event with staff, refreshments, and space for the artists.